I found this alcohol free beer at Countdown and thought it could be helpful to get through Dry July. 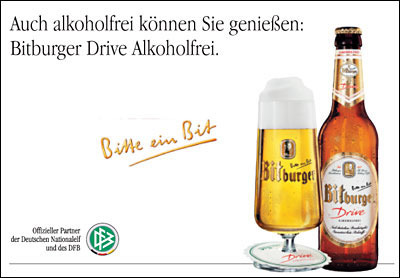 Bitburger Drive; it claims an abv of no more than 0.05%. That’s miniscule enough for me to say it isn’t cheating. As far as beers go, it isn’t too flash, but if you’re a fan of the US giants like Budweiser and Coors Light then this could be right up your alley. It pours very, very pale yellow with a decent head and tastes like an adjunct filled lager with a nice bitterness in the aftertaste. You might notice my descriptions here aren’t very good; that’s because I didn’t give it enough respect to take any notes. 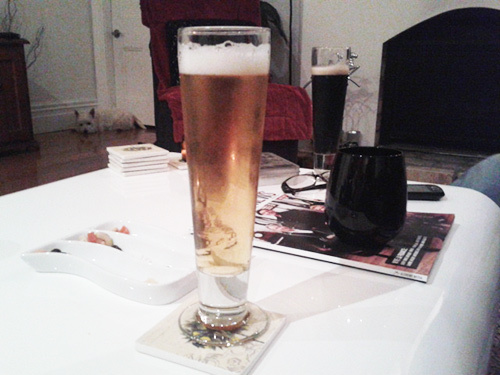 And to be honest, if you’re reading this blog you probably won’t try it anyway… unless you’re in Dry July too. I’m not a big fan of beverages that are too sweet tasting or sugary; and with the bitterness in the back of this alcohol-free beer it ticks a box for me. At any rate, it will certainly help this weekend when I finish the tiling in the bathroom.